Standard valve wrap. Available with velcro or leather cord lace-ups. 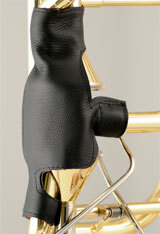 The Deluxe Trumpet Valve Wrap covers every area trumpet players touch. Available with velcro or leather cord lace-ups. Contains one guard for outer slide and another for the inner slide cork barrels. 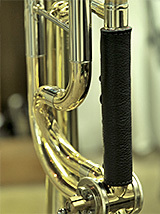 Available for Edwards, Bach and Shires symphonic tenor trombones with single Thayer valves. This can also be used as a standalone pencil holder attached anywhere on your F valve tubing. Available in black leather only. 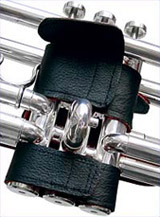 The large bore trombone neck guard will cover your straight Bb trombone neckpipe. This guard does not have a pencil holder. 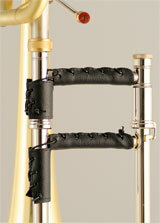 Valved tenor trombones will need the "Symphonic Neck Guard with Pencil Holder" above. 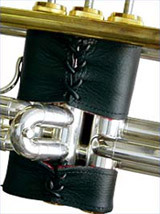 This neck guard fits the Edwards T396-A Alessi Model tenor trombone. 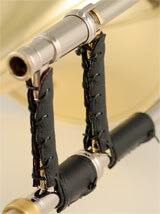 This item can be used to wrap your King 2B, 3B, Edwards and many other small bore jazz trombone neckpipes. Does not include a pencil holder. Keeps skin away from freshly oiled valves. The guards reduce oil spots on clothing. The NY blank weighs slightly more than modern day Bach mouthpieces (Elkhart blanks). Its weight is distributed evenly around the bottom of the cup. This results in an even core of sound with overlapping overtones, creating a tone quality that is thicker than conventional mouthpieces. The NY also provides the midrange overtones that are often lost with other mouthpieces. The Deco blank is heavier in mass than the NY blank. The added weight is great for large bass trombone mouthpieces that may have thinner walls due to larger inner cup diameters. 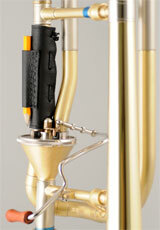 It is very free blowing and can provide a bigger, darker sound than mouthpieces with less weight. The Deco also provides stability, which can help define partials on those trombones where extra focus is needed. Our newest mouthpiece blank, the Nouveau was created to give trombonists the flexibility a lighter mouthpiece can provide. It provides a width of sound and wider partial feel for a natural playing experience. Every tone and timbre can be manipulated, making the Nouveau a very expressive mouthpiece.